Blog Quick Quotes: Petaloo Blog Hop - Day 4! Petaloo Blog Hop - Day 4! We are so excited to bring you inspiration with our friends at Petaloo! Hi, Connie here with an "off the page" project using the gorgeous flowers from Petaloo and the gorgeous papers and PowderPuff Chalk Inks from Quick Quotes. *Take an old muffin pan and using Tim Holtz's paper Rosette die (large) cut 6 rosettes out of Gypsy Road 300 and Gypsy Road 400, 3 of each paper. * Ink the rosettes with Sunset PowderPuff Chalk Ink. * Using 1/2" foam, adhere the rosettes to the center of each section in the muffin pan. * Adhere the butterfly by Petaloo to each section of the muffin pan. 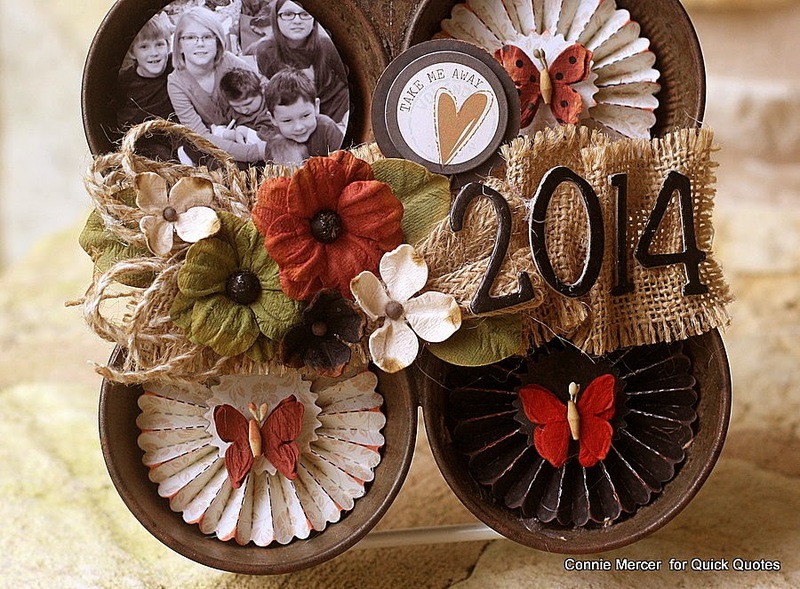 * Using the burlap trim, from Petaloo, create a center banner for flowers and the date. * Wet glue or hot glue will work for this. * Attach a favorite photo, to one of the sections of the muffin pan. This is the muffin pan before I started altering it with the beautiful Petaloo and Quick Quotes products. You can see more inspiration, using Petaloo and Quick Quotes over on the Petaloo Blog . 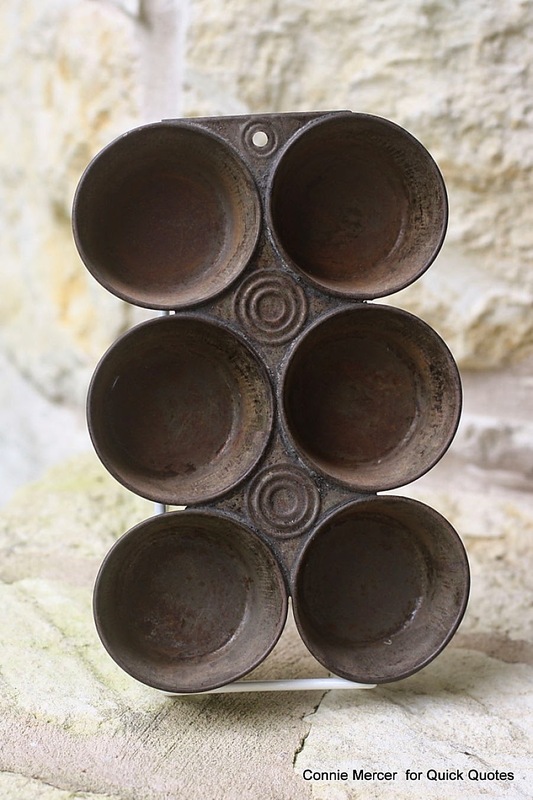 What an awesome use of an old pan, great recycling project and beautiful to boot. I love it! Very creative! Great project, would love to have that hanging in my kitchen. What a wonderful way to recycle something that would probably end up in the trash. It is beautiful. It will look great anyway in the house. thanks for the idea. Great use for old pan. what a fantastic idea! my mother would love this! right up her alley! I am pinning this one!! great job! What a clever idea! I have an old pan just like this, I never would have thought of using it this way! Just darling! How very clever and so vintage! Very cute. Love the recycled muffin tin. Cute wall hanging. 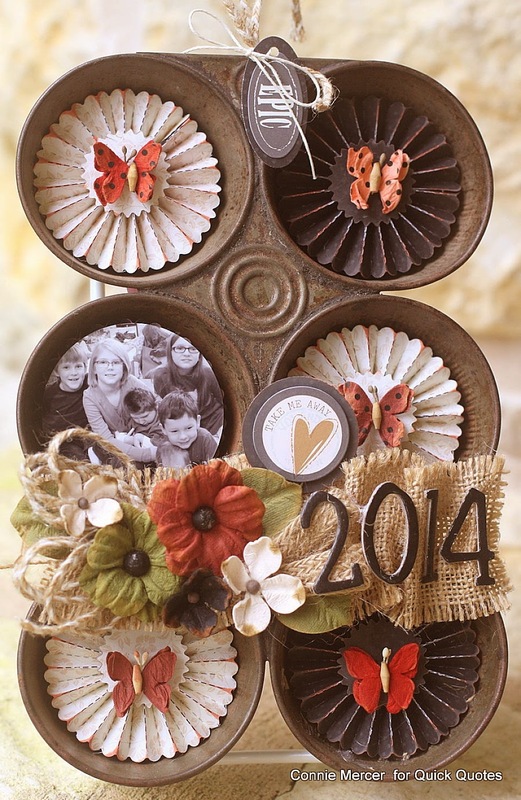 This is a fantastic use of a vintage muffin tin. The rosettes with the flowers and butterflies bring the project together. A great house warming gift! What a great idea! I love that muffin tin with the rosettes inside. Thanks for sharing this idea with us. Weekday a great upcycle project! Who would have thought an old muffin tin could make something so pretty? What an amaaaaaaaaaaaaaazing project!!! So incredibly cute and creative!! !